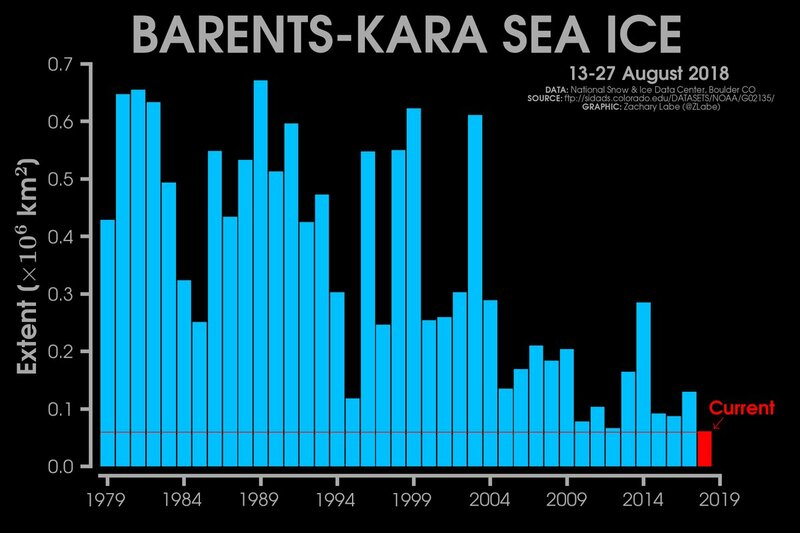 Record low in the Barents and Kara Seas region. Average sea ice extent over the last 2 weeks was a record low in the Barents and Kara Seas region. This area is located on the Atlantic side of the #Arctic. It is a particularly interesting region to monitor climate change and variability. The Bureau of Meteorology has released its latest climate outlook, and the forecast is grim. It has been a dry summer, followed by a dry autumn, followed by a dry winter, for large parts of the country and it looks like spring is going to follow the trend. The prolonged dry is starting to put a strain on water supplies, with some communities dealing with dam levels down to 10 per cent. "So this is going to compound the already dry conditions that we've been experiencing across eastern Australia." Ms Duell said it's been the driest start to the year New South Wales has seen since 1965. "It's very comparable to some of the most severe rainfall deficits we've seen. It's been very unusually dry in the east." 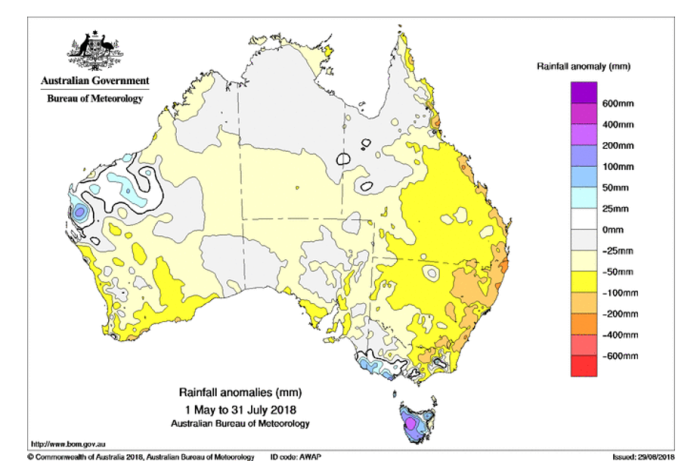 For most of mainland Australia the warm and dry start to the year has led to dry soil moisture and dry vegetation. "We've already seen some bushfires in New South Wales during August which is unusually early," Ms Duell said. She said there are a lot of elements that go into bushfire risk but this spring's dryer and warmer outlook certainly has the potential to increase fire risk. But while the drought has extended into parts of Queensland and Victoria, not everywhere has been dry. Western Tasmania and south-west Western Australia have been very wet over the past few months. The climate drivers are looking like they are just going to make things worse this spring. 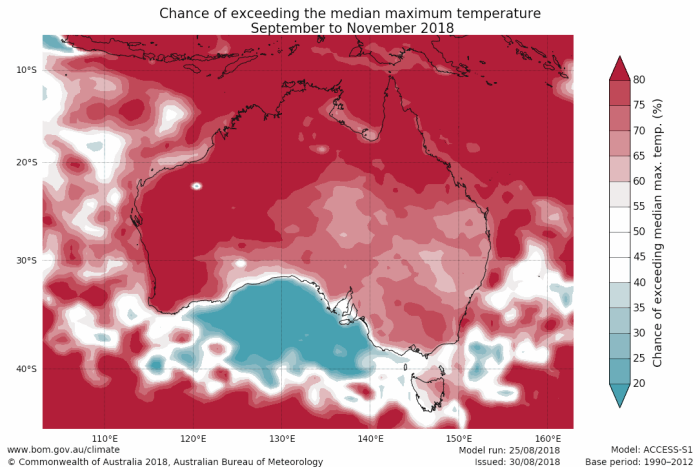 The bureau currently has an El Nino watch in place, indicating there is twice the normal chance of El Nino, associated with dry conditions in the country's north and east, forming in the coming months. But Ms Duell is not just focused on the Pacific. "At the moment we're keeping quite a close eye to the north-west of Australia," she said. "We've had cooler than usual water there for a little while and sometimes that can be the indication of the start of what we call the positive Indian Ocean Dipole event." Ms Duell said cool water in the north-east can cause a change in the way frontal systems move across the south of the country. "They often slip further south than they usually would," she said. "That's something that we've been seeing happening through winter and that looks like it may continue to happen during spring." The outlook said low stream flows are expected to continue over the south-eastern mainland through October, thanks to predicted dry conditions on top of already dry soils. 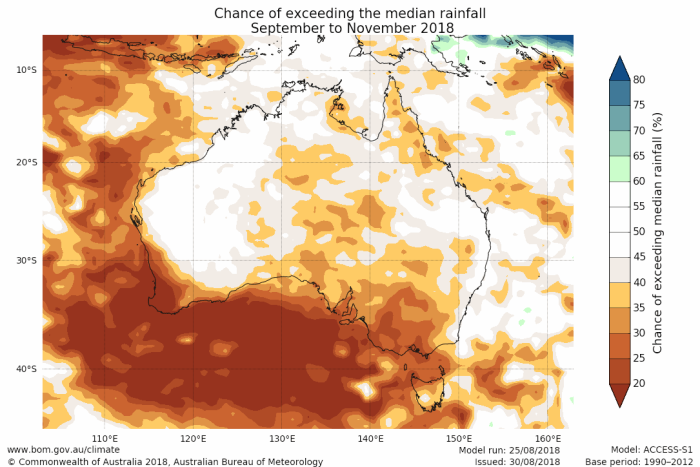 Near median and high flows, however, could eventuate on the south-west coast of Western Australia and in Tasmania, where catchments are already primed following good winter rains. What does this mean for water supplies? According to the Bureau's water storage data, Sydney and Adelaide's water supplies are both well down on last year. The situation varies greatly depending on where you are and how you are getting your water. Generally the big city dams have a long way to go before they get into any real trouble. "The Sydney situation is pretty good, but it's dry," WaterNSW spokesman Tony Webber said. "The regions fluctuate from quite concerning to reasonably good." But it is where people are relying upon water outside the dam system that things deteriorate. "The dry land farming situation, where people are reliant on waterways not fed by dam storages, is actually quite dire," Mr Webber said. Water New South Wales has Sydney's water capacity at 65 per cent, despite the dry catchments and low inflows. "The major dams that were talking about, even though we are seeing some storages falling below what we prefer, they are very large storages and they hold a lot of water," Mr Webber said. "There is up to two years' supply, even under the worst case scenario, for the Sydney storages." The overall capacity of the regional dams managed by WaterNSW is at 52 per cent, but according to Mr Webber that figure does not tell the whole story. "In the south of the state, the dam storages that feed the Murrumbidgee are actually in quite a good situation, water security wise. Blowering and Burrinjuck Dams both are well stocked," he said. "In the central regions of the state Wyangala Dam on the Lachlan River, which was the scene of that extensive flooding in 2016, it still sits at 59 per cent." Others, like Burrendong Dam in the Macquarie Valley, which is at 32 per cent, are starting to feel the strain. "The situation is getting a little bit tighter there, but they have very, very big storages. So that's still a long period of supply." Who is running out of water? The real pinch points, according to Mr Webber, are the Keepit Dam in the state's north and the Menindee Lakes in the west. Both are down around 10 percent of capacity and the outlook does not inspire a huge amount of hope in either case. Menindee Lakes provides water for the nearby city of Broken Hill and also down the lower Darling river to the Murray. 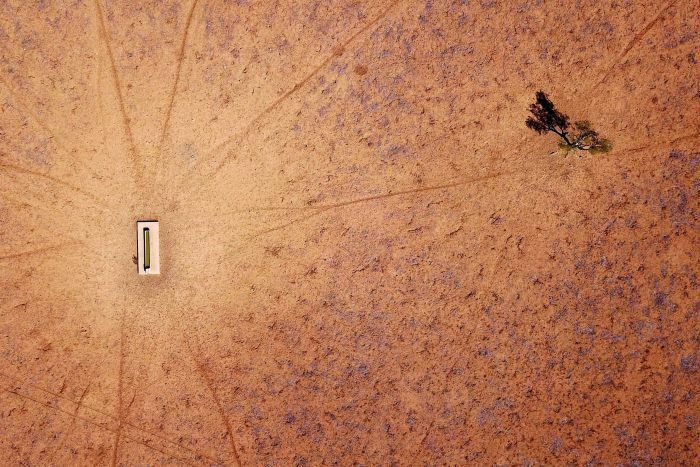 Broken Hill only received 9.4mm of rain from the first of June to the 28th of August this year — just 18 percent of the average. Mr Webber said if there are not any significant inflows into the lakes releases into the lower Darling may cease by December this year. The aim is to hold supply for Broken Hill while a pipeline is built to link the town directly to the Murray River. According to Mr Webber, the pipeline will be completed by the end of the year and will provide water security for Broken Hill. But for Keepit there is no pipeline dream. Mr Webber said Water NSW has been working with local landholders and communities to ensure essential human needs can be provided. "Rather than releasing water subject to water orders from customers individually, it would really be just a more significant, perhaps a one-off or series of releases at an agreed time," Mr Webber said of a possible contingency plan should worse come to worst. "So that people with basic stock and domestic access rights can top up their storage. "Just to make sure they've got at least an extended water supply while we wait for the weather to change." Mr Webber said the water security situation for most water customers is quite good but he does not want to give those suffering false hope. In New Zealand NIWA is a bit light-on-it and there has been nothing in the media. Scientists have discovered warmer water that originated hundreds of miles away has penetrated deep below the ice pack’s surface. 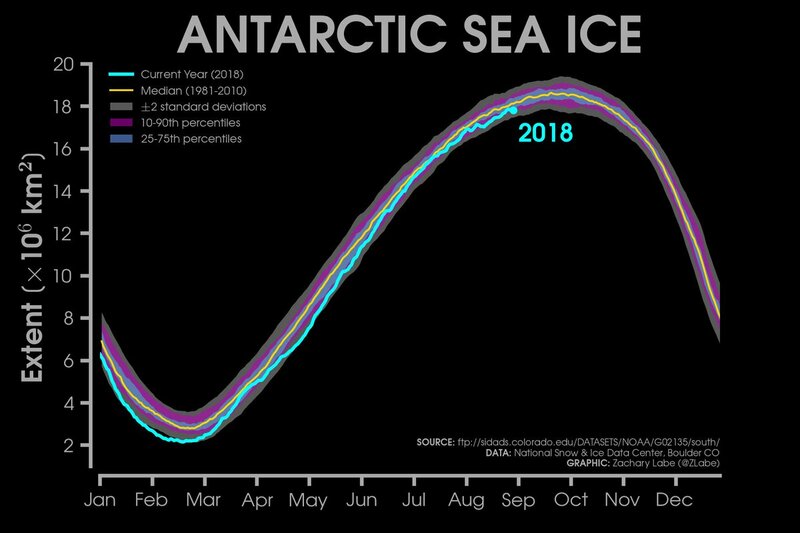 Vast swathes of the polar expanse are changing dramatically every year – with sea ice vanishing far earlier in the season that it used to, and ships beginning to take advantage of the newly ice-free oceans. This effect could be exacerbated in one of the Arctic Ocean’s major regions – known as the Canadian Basin – by the influx of warmer water that is currently stored underneath it. 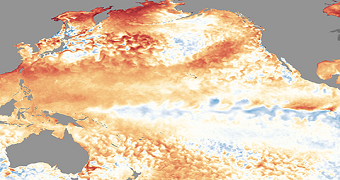 Using data collected over the past 30 years, researchers at Yale University and Woods Hole Oceanographic Institution saw the “heat content” of the area had doubled during this period. 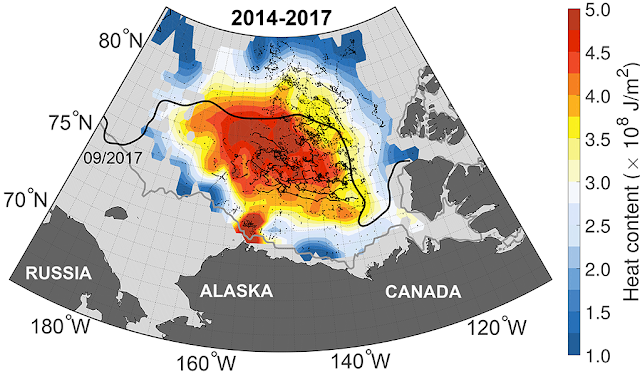 They were able to trace this water to the Chukchi Sea further south, where the regional decline in sea ice has left the water very exposed to the summer sun. After heating up, this water has been driven north by Arctic winds, but has remained below the top layer of water – resulting in a high-temperature zone trapped far beneath the ice pack. 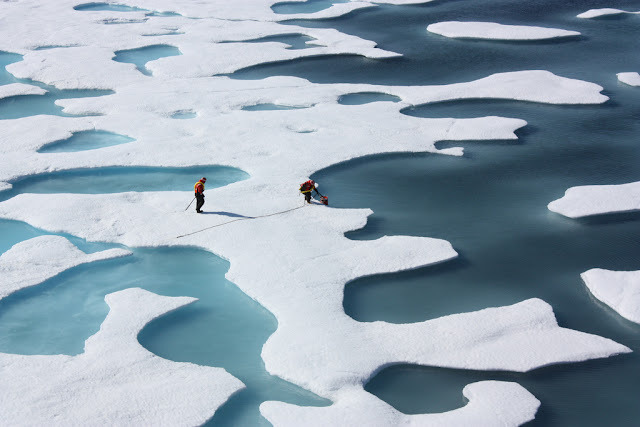 “This means the effects of sea-ice loss are not limited to the ice-free regions themselves, but also lead to increased heat accumulation in the interior of the Arctic Ocean that can have climate effects well beyond the summer season,” said Yale geologist Professor Mary-Louise Timmermans, who led the study. This research was published in the journal Science Advances. The Arctic is warming at twice the rate of the global average, and year after year bodies like the US National Oceanic and Atmospheric Administration report record-breaking climate extremes in the region. Last year saw the lowest ever measurements for maximum winter sea ice cover across the Arctic, and the second warmest air temperatures on record. These changes have caused havoc for the people and animals that inhabit the polar region. Almost all the ice covering the Bering Sea in the northern Pacific Ocean vanished a month early this year, impacting the hunting and fishing activities of the inhabitants of western Alaska. The recent breakup of the “last holdout” of thickest ice in the Arctic was described as “highly unusual” by scientists. This breakup is an unsettling sign of climate change, and experts warned that it would likely have a serious impact on the region’s polar bears and seals.